The clear standard excellence, the Adjustable E-Nano Stem! 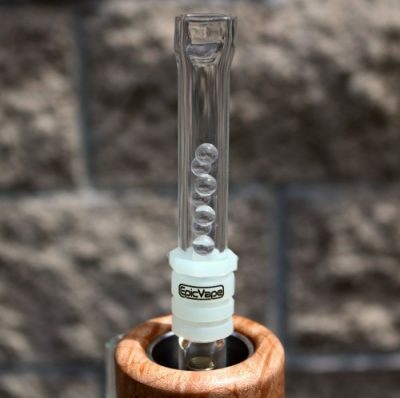 The heavy Borosilicate glass Adjustable E-Nano stem with stainless steel basket screens. This stem allows you to adjust the size of your bowl and distance from the heating element. Hand polished on both ends. Comes complete with our exclusive 100% silicone glow in the dark heat guard. Packaged in a plastic sleeve which makes for easy cleaning. These stems fit perfectly in the Standos. Their Heavy duty design gives you piece of mind while their silicone guard helps protect slippery hands. Part of the E-Nano kit, we suggest grabbing a few extras. Check out our other glass accessories! these stems are great, to put it simply. they are very, very durable – I’ve dropped mine on hard surfaces a few times from my lap, and not a scratch, crack, or blemish to be found. it has a built in lip on the end, so that when you use it on your E nano, it doesn’t slide too far down and sits right in the perfect spot. I prefer these over the all glass honeycomb because its adjustable, and I find the the honeycomb is way too small. they get a little hot, but every one of these comes with a glow in the dark(handy) silicone grip thats moveable, so heat has never been an issue and I’ve used it for awhile now.its a great item, and it is proprietary so you need these if you have an e nano. don’t hesitate to buy these, I’m here buying a backup cherry e nano because I love my premium walnut so much, if it breaks(very unlikely) I refuse to be without my e nano. great stems, buy the 6 pack!